Irritant to skin and mucous membranes. 2,4-Pentanedione (acetylacetone), if present or released, is harmful if swallowed, and may irritate the eyes. 2,4-Pentanedione has caused reproductive effects in laboratory animals and is also flammable. Cobalt(III) Acetylacetonate is a Cobalt source that is soluble in organic solvents as an organometallic compound (also known as metalorganic, organo-inorganic and metallo-organic compounds). The high purity acetylacetonate anion complexes by bonding each oxygen atom to the metallic cation to form a chelate ring; because of this property, acetylacetonates are commonly used in various catalysts and catalytic reagents for organic synthesis, including the fabrication of various shapes of carbon nanostructures (as demonstrated by a 2013 experiment by researchers at the Leibniz Institute for Solid State and Materials Research Dresden) via the use of chemical vapor deposition (CVD) and laser evaporation techniques. Cobalt Acetylacetonate is one of numerous organo-metallic compounds (also known as metalorganic, organo-inorganic and metallo-organic compounds) sold by American Elements under the trade name AE Organo-Metallics™ for uses requiring non-aqueous solubility such as recent solar energy and water treatment applications. Similar results can sometimes also be achieved with Nanoparticles and by thin film deposition. Note American Elements additionally supplies many materials as solutions. American Elements produces to many standard grades when applicable, including Mil Spec (military grade); ACS, Reagent and Technical Grade; Food, Agricultural and Pharmaceutical Grade; Optical Grade, USP and EP/BP (European Pharmacopoeia/British Pharmacopoeia) and follows applicable ASTM testing standards. Typical and custom packaging is available. Additional technical, research and safety (MSDS) information is available as is a Reference Calculator for converting relevant units of measurement. See more Cobalt products. Cobalt (atomic symbol: Co, atomic number: 27) is a Block D, Group 9, Period 4 element with an atomic weight of 58.933195. 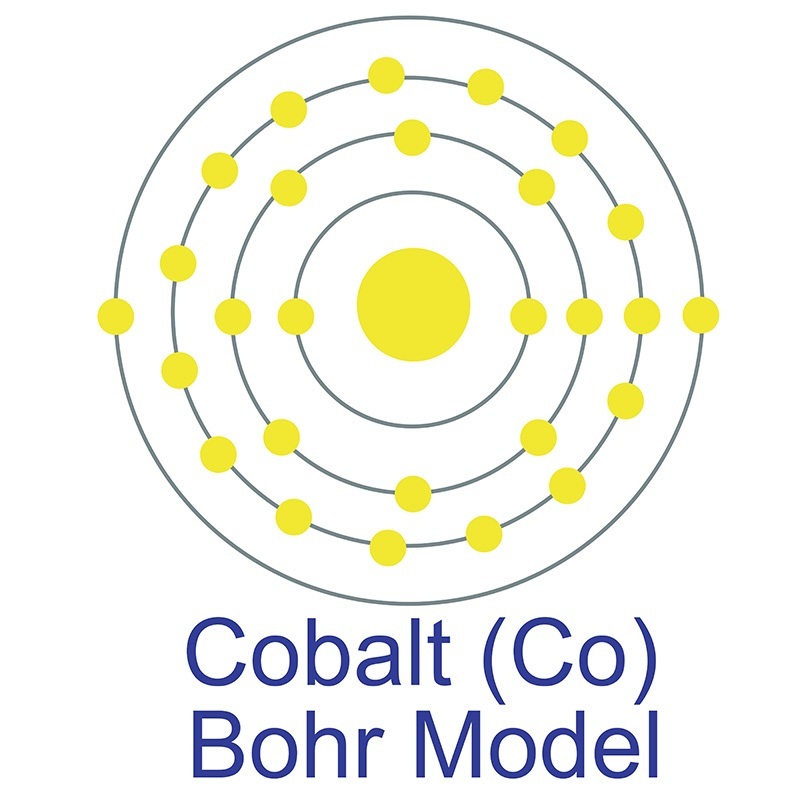 The number of electrons in each of cobalt's shells is 2, 8, 15, 2 and its electron configuration is [Ar] 3d7 4s2The cobalt atom has a radius of 125 pm and a Van der Waals radius of 192 pm. Cobalt was first discovered by George Brandt in 1732. In its elemental form, cobalt has a lustrous gray appearance. Cobalt is found in cobaltite, erythrite, glaucodot and skutterudite ores. Cobalt produces brilliant blue pigments which have been used since ancient times to color paint and glass. Cobalt is a ferromagnetic metal and is used primarily in the production of magnetic and high-strength superalloys. Co-60, a commercially important radioisotope, is useful as a radioactive tracer and gamma ray source. The origin of the word Cobalt comes from the German word "Kobalt" or "Kobold," which translates as "goblin," "elf" or "evil spirit." For more information on cobalt, including properties, safety data, research, and American Elements' catalog of cobalt products, visit the Cobalt element page. Weakly Coordinating, Ketone-Directed (η -Pentamethylcyclopentadienyl)cobalt(III)- and (η -Pentamethylcyclopentadienyl)rhodium(III)-Catalyzed C-H Amidation of Arenes: A Route to Acridone Alkaloids. Development of a cobalt(II) phthalocyanine- MWCNT modified carbon paste electrode for the detection of polyunsaturated fatty acids. Cobalt Phthalocyanine Tetracarboxylic Acid Functionalized Polymer Monolith for Selective Enrichment of Glycopeptides and Glycans.